Home | Microbe-Lift | Break down harmful substances and cut point care in half! 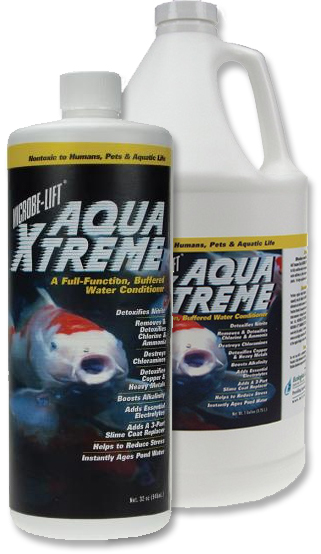 BREAK DOWN HARMFUL SUBSTANCES AND CUT POND CARE IN HALF! oils, fats, proteins, nitrate, dead plant debris, dead algae, bird droppings, fish waste, uneaten food, bottom sludge, etc. WHY SHOULD I ADD BACTERIA TO MY POND? This is understandable, because these two substances are always produced (see nitrogen cycle) and are extremely harmful/deadly for our fish. With a properly functioning filter, however, ammonia and nitrite are not a problem. It is only during the first few weeks of a new pond environment or a new filter system that ammonia and nitrite are a problem. As soon as the water and the filter ‘mature’, this problem is solved. Unfortunately, most bacterial products are assessed/tested based on this situation. In the past, comparative studies were occasionally conducted to determine which brand of bacteria could most quickly break down ammonia and nitrite, while this actually is not the biggest problem. 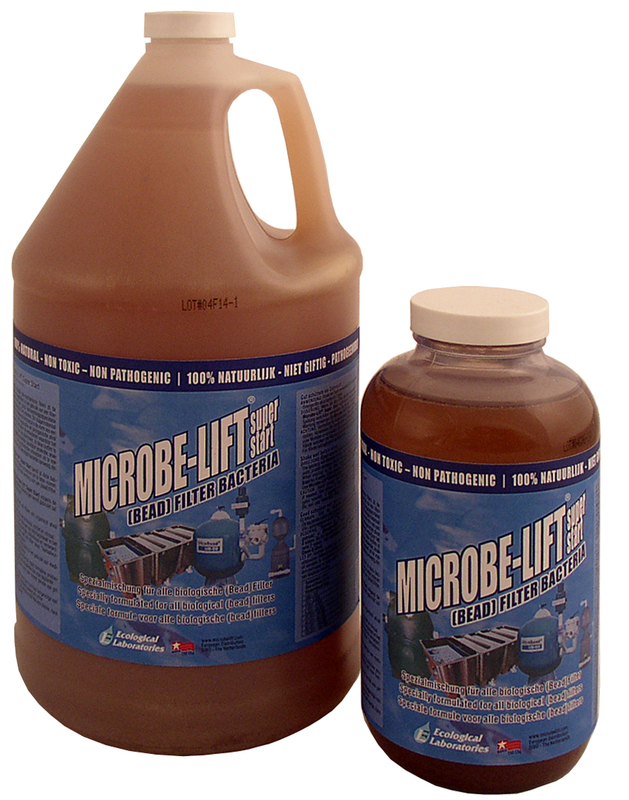 MICROBE-LIFT is grown in the bottle in which it is sold. The reason for this is that the organisms grow synergistically. It is actually an ‘ecosystem in a bottle’. They are grown together because together they must work together in the pond. This production method is unique in the world and cannot be copied. These are very useful to bring the ecology of the pond in balance. These bacteria can use sunlight as an energy source for natural biological processes that keep your pond clean and clear. The photosynthetic bacteria are also the cause of the characteristic purple/red colour (and the smell!). In the beginning of the culturing process, the liquid is still clear. The purple/red colour develops after a few days of exposure to sunlight. The photosynthetic bacteria consume the nutrients and produce hydrogen sulphide (rotten egg smell), which puts them to sleep. This gives the bottles a shelf life of 3 to 5 years! Ecological Laboratories produces a product which is the equivalent of an “ecosystem in a bottle” with all the necessary organisms required to fill in gaps in the lakes ecosystem which have resulted from environmental stresses. The bacteria are fully functional once the product is added to the pond or lagoon without having to “germinate” like spore based products. What makes Microbe-Lift® products work so well? 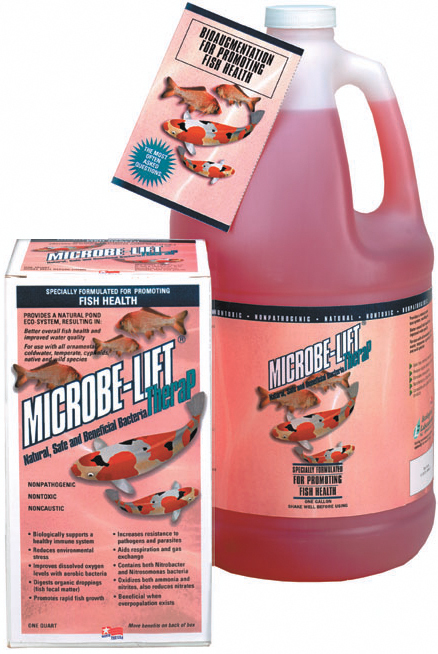 Microbe-Lift® products like Clean & Clear and Super Start have a full complement of photosynthetic, aerobic, facultative anaerobic, anaerobic, and chemosynthetic organisms which address all the common problems encountered in pond maintenance including high ammonia and nitrite, undigested organics, algae blooms, organic sediment build-up and foul odours. Can Microbe-Lift Clean & Clear be diluted with water before use? No. Microbe-Lift products should be shaken and used as it is. Why does the product smell like rotten eggs? The smell is attributable to the natural production of hydrogen sulphide by sulphate reducing bacteria as part of the ecosystem. This provides a source of energy for the purple sulphur bacteria in the product and as a metabolic inhibitor preserves the product giving it it’s long shelf life. If I have a biological filter, how do I apply the Microbe-Lift product? Apply it directly to the pond. The organisms will establish a bio-film on the filter media as they circulate through it in the pond water. Do the microbes need special conditions in the pond in order to work? Microbe-Lift products can’t be used with pesticides or algaecides. For best result switch of UV, ozone and/or protein skimmers for 2-3 days. What will Microbe-Lift do for my pond? It reduces ammonia and nitrite levels, reduces noxious odours caused by urine, faecal matter, algae, overfeeding, etc., reduces hydrogen sulphide odours, improves dissolved oxygen, breaks down algae, reduces build-up of bird droppings.